S/M (L). 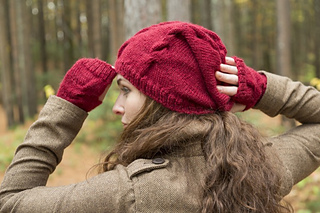 Shown in size L.
A warm slouchy hat with cables on the front and stockinette stitch on the back. Circular knitting needle (16”) and double pointed needles (dpn) in size US 5 (3.75 mm) or size to obtain gauge. 23 sts and 30 rnds = 4” in St st. Take time to save time, check your gauge.